There’s nothing more adorable than a tray full of macarons. If you’re a lucky New Yorker, you can get your French fix at the Bosie Tea Parlor, the recently-opened Ladurée, or any number tasty little bakeries dotted around the city. For most of us, however, they are not as available. We can only dream of rows upon rows of lovely, little jewel-like cookies. Unless, of course, you are willing to take matters into your own hands. After months of deprivation, the withdrawal symptoms just got to be too much. So I braved the kitchen and took on what felt like an impossible task. I had heard horror stories of macarons deflating and batter running off of the cookie sheets, but I figured that I really had nothing to lose. If worst came to worst, I would be left exactly where I started: macaron-less. After trolling the Internet and quite a few cookbooks, I settled on a simple recipe from Martha Stewart to use as a jumping-off point. My friend Ellie and I spent a little longer debating possible flavors, finally landing on Victoria Sponge. There’s something so wonderful about a good Victoria Sponge. It just feels comfortable. Uniting an iconic British dessert with one so emblematic of France’s food culture turned out to be a great decision. It seems the French and the British can get along, after all. For the macarons, preheat oven to 350˚ F. Line two baking sheets with parchment paper. If you have a pastry bag, fit it with a 3/8-inch #4 tip. If not, cut the tip off of a corner of a small sandwich bag. In a small bowl, whisk together icing sugar and ground almonds. Using an electric mixer, whisk egg whites with salt on medium speed until foamy. Increasing the speed to high, slowly add caster sugar and continue to whisk until stiff peaks form. Gently fold in almond mixture until just incorporated. Fill pastry bag or plastic bag with batter. Pipe 1-inch disks onto parchment paper, leaving an inch between cookies. Allow macarons to sit for 15 minutes at room temperature. Bake for 13 minutes, until surface of macarons is completely dry. Place on a wire rack to cool completely before removing from baking sheet. Gently peel from parchment paper and set aside until ready to fill. To make the buttercream, cream butter using an electric mixer until light and fluffy. Add icing sugar and beat, starting at a low speed, and gradually increase speed until icing sugar is completely incorporated. Beat in milk, vanilla beans, and vanilla extract. 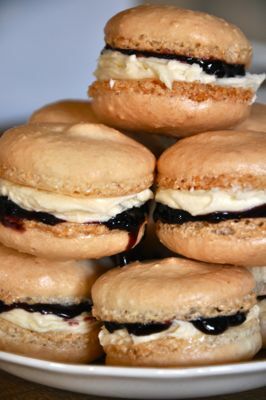 To assemble the macarons, spread buttercream onto half of the cookies. Spread jam onto the other half. Sandwich together the halves with buttercream and those with jam. Refrigerate for an hour, until firm. Categories: Baking, Blog, and Recipes. I'm Cooking For...: Birthday, Brunch, Dinner Party, and Myself.